Yes, you can edit your mistakes. 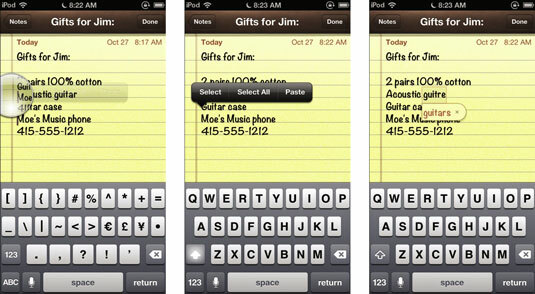 To edit text in an entry field on your iPod touch, touch and hold to see the magnifier, which magnifies portions of the text view. Before releasing your finger, slide the magnifier to the position for inserting text. After releasing, the Select/Select All/Paste (or Select/Select All) bubble appears above the insertion point, which is useful for selecting, copying, and pasting text. You can then tap keys to insert text, or you can use the delete key — the key sporting the X in the lower-right side of the keyboard — to remove text. The intelligent keyboard automatically suggests words (or corrections to words) while you type. You don’t need to accept the suggested word — just continue typing. If you do want to accept it, tap the spacebar, a punctuation mark, or the Return key. iPod touch fills in the rest of the word. To reject the suggested word, finish typing the word or tap the tiny x next to the suggestion to dismiss it. Each time you reject a suggestion for the same word, your iPod touch keeps track and eventually adds the word you’ve been using to its dictionary. The iPod touch includes dictionaries for English, English (UK), French, French (Canada), German, Japanese, Spanish, Italian, Dutch, and other languages. The appropriate dictionary is activated automatically when you select an international keyboard.